This is Part 6 - Making a egg crate for a breedable pet in Second Life. As your birds breed, they will lay eggs. If you need to move eggs, they must be put into an Egg Cup. An egg cup is a way to keep eggs in inventory. Cryo-crates and egg cups should be given out for free. Put the three prims together to make an egg balanced on a large half-sphere. Select the cup, then the top half of the egg and finally the bottom half of the egg and press ctrl-L to link them together. name this object 'Egg Cup'. Image courtesy of Len W. Brown. Put a copy of xs_eggcup in the Egg cup. 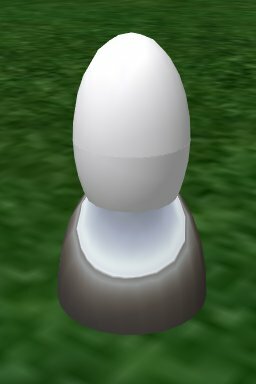 Put a copy of the XS Egg and Quail from your inventory in the egg cup. Set the permissions on the scripts in your egg cup to no-modify.